Sorry, senator, but Floridians sent you to Washington to do a job. We’ve got serious problems with clogged highways, eroding beaches, flat Social Security checks and people who want to shut down the government. If you hate your job, senator, follow the honorable lead of House Speaker John Boehner and resign it. Let us elect someone who wants to be there and earn an honest dollar for an honest day’s work. Don’t leave us without one of our two representatives in the Senate for the next 15 months or so. You are paid $174,000 per year to represent us, to fight for us, to solve our problems. Plus you take a $10,000 federal subsidy — declined by some in the Senate — to participate in one of the Obamacare health plans, though you are a big critic of Obamacare. You are ripping us off, senator. Rubio has missed nearly 60 votes (about a third) so far this year while on the campaign trail, something Donald Trump—who has, of course, never held public office—has gleefully underlined. 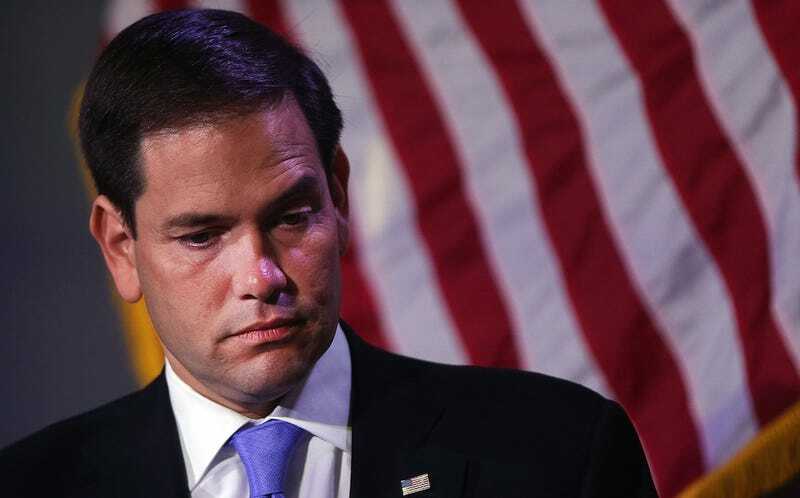 But Rubio has implied that his frustration with the “pace” of the Senate is part of the reason why he doesn’t like to show up (never mind that such frustrations are a natural byproduct of belonging to a political party made up of egotistical obstructionists, fundamentalist maniacs, and dumb people). Equally frustrated, clearly, are the Florida voters who believe Rubio is defrauding them.